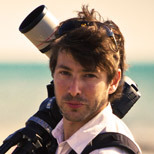 Jonah Kessel is an award-winning visual media specialist and cinematographer whose work has appeared in The New York Times, the Wall Street Journal, the Los Angeles Times, CNN, the Economist and the Atlantic Monthly. To date he has published more than 100 videos. He's currently based in Beijing, China.